When Ted Aikman was a boy, there was one major rule in the family's household. Ted and his three brothers were not allowed to fight anywhere in the downstairs portion of the home. "It's the King's X down here," Ted's father, Gilbert, would say. That meant 'time out.' The downstairs of the Aikman household was a no-trouble zone. So, in 1963, when Gilbert was looking to open a bar on the edge of El Paso, he decided to name it after that peaceful zone where his sons were not allowed to roughhouse -- The King's X. It wasn't anywhere near being the first bar his dad had opened, said Ted. "I could never get a straight answer from dad," said Ted. 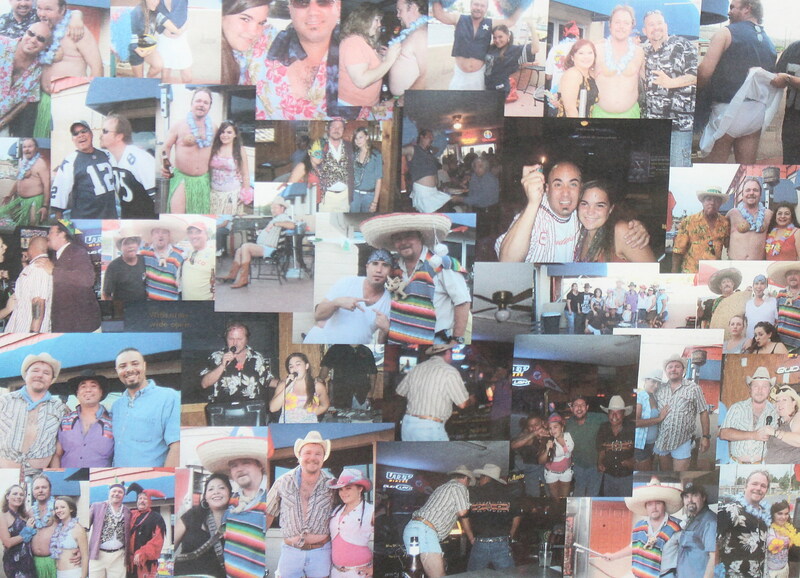 "He had interest in -- or outright owned -- between 16 and 21 bars in El Paso. He would say he had a bar on every corner in the downtown area. If someone opened one and it didn't work out, he'd take it over to keep some other bar from opening there." It was hard work, running a business. Gilbert would work the day shift until Mary got off of work from her job as a secretary for G.E. Then, Mary would work for 4-5 hours at night before Gilbert returned to close the bar and clean it. Then he opened it again the next morning. When Haskell Aikman passed away from cancer, Gilbert and Mary had to sell a couple of their bars to pay off his hospital bills. When Gilbert owned The Patio, the government used eminent domain on him to build the city's Civic Center. The lesson is: times weren't always easy, but the family kept rolling with the punches. A collage of pictures hanging in Ted's office. Click for a larger version. "When people ask me about advice on getting into the bar business," laughed Ted Aikman. "I tell them -- 'Don't.' Dad used to explain why the crown in the King's X sign only has three prongs -- it was cheaper than five prongs." The bar business takes a lot of commitment, and there can be a lot of pitfalls for those who aren't responsible. "Your friends come in, and they want to drink for free. And then you want to drink, but you can't run a business like that. There's no drinking while I work." You heard it from the source: opening a small business isn't for the faint of heart. When The King's X opened, Mesa Street was basically the road out of town. Once you passed the bar, you were in the desert. Today, it's in the center of one of the city's busiest districts. Ted Aikman said he has customers now that have come to the King's X nearly every day for 20 years. His oldest patron has been a regular for around 47 of the bar's 53 years. As the years passed, Ted just slotted himself right into the family business, using his father's experiences to lead the way. "He'd tell me what to do, and I'd do it," said Ted. "I did it my own way, but still, I'd do it." He's met and/or hosted musicians, like Long John Hunter; movie stars like Tommy Lee Jones and Larry B. Scott; pool sharks like Minnesota Fats and Willie Mosconi; and even athletes like "Mean" Joe Greene. But the greatest compliment, said Ted, is hearing tourists and visiting strangers say how King's X reminds them of their own hometown bar, even in cities like Philadelphia or Chicago. Nowadays, The King's X is the last remaining bar owned by the Aikmans. Ted said his mother retired in 1989 when the Midtown Lounge closed. Now, Ted says his 23-year-old daughter and recent UTEP graduate, Taylor, would like to see the bar go for another 50 years. He'd rather see her travel the world and do the things he never got to do. But in today's world, maybe we need more throwback places like King's X to hang out. Good luck, Taylor.